Experience amazing sound that’s previously not been possible from a small screen TV with the built in 10W soundbar! Make the most of the amazing sound and stream endless music direct to the TV from your phone or tablet courtesy of built in Bluetooth. The perfect gaming monitor! A perfectly formed screen with 75Hz refresh rate, an incredible Full HD picture and booming sound from the built in Soundbar - what more do you need? I bought this TV just to go in the kitchen, it was a lot cheaper than Panasonic which I normally buy so I was a little sceptical. After three weeks of use I can’t fault it, it’s just as good as my Panasonic so I’m well pleased. The TV arrived yesterday. It was very straightforward to assemble and to set up, looked pretty good and was also very straightforward to operate. One of the other reviews commented on problems with the viewing angle. I had already checked by phone with John Lewis, who said that such a comment would obviously be very subjective and would depend on many other factors. They reassured me that if we had any similar problems, it would be very straightforward to return the TV for a refund. Sadly, when my wife and I sat to watch, each of us at angles above 45 degrees to the screen, we each had a very poor result. For me the picture was quite indistinct and the colours very unnatural, no matter how I changed the picture via the menu. Face on, the picture was exactly as good as one would expect. We are returning the TV today. Good picture, great sound for a small tv. Good value and the 5 year guarantee is a valuable benefit. Very pleased with this purchase. We replaced an old Toshiba with this little beauty. It fits snuggly on the kitchen work surface. The picture quality is great but the sound exceeded all expectations, add in the Bluetooth connection and it makes this TV the perfect all in one TV. Throw in a 5 year warranty makes it excellent value for money. The picture is only good when viewing straight on. It is significantly worse at about 20 degrees and is awful at more than 45 degrees. The sound is one of the few good features, but the sound bar (below the screen) is hardly attractive. The response to most remote control inputs is VERY slow, so bad that I often found myself pressing buttons twice. - does not go past midnight, e.g. if watching at 23:30 only displays programmes beginning before midnight! The DVD basic operation seems OK but somehow it kept going into a non-responsive mode, where the only way to get it to respond was to disconnect the set at the mains plug! The favourites function is useless, and has no effect when using the channel +/- buttons. The set has a "warm" picture mode, which would be very useful when viewing late in evening, but access to it is buried deep in the settings controls. Beautiful picture and great sound quality. Really pleased with our choice of tv. Bought for bedroom, nice size, great picture and sound, with added bonus of 5year guarnantee!! 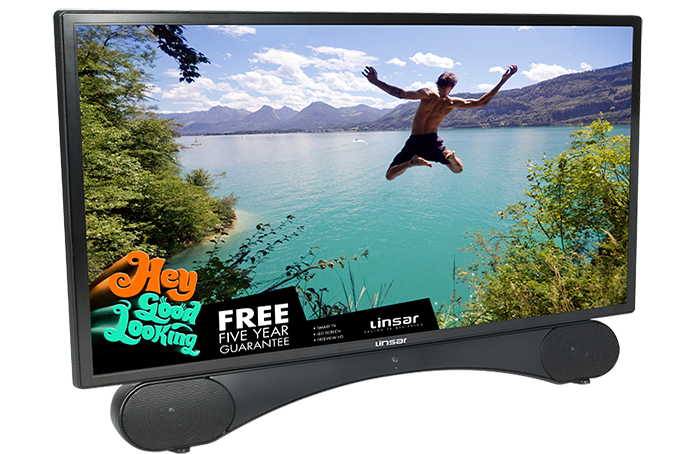 I was looking for a non-smart TV / DVD and hadn't heard of Linsar, but the John Lewis 5-year guarantee gave me the confidence to buy this machine. I was so happy with it that I bought another one for my Mum. My first impression wasn't good, as nothing seemed to happen when I pressed the handset buttons. When you press the power button, nothing happens for 4 seconds (not even a blinking LED for instance), so I had tried pressing the button again which of course put the machine off. After I had worked that out, setting up the TV for the first time was easy. The picture quality is reasonably good, especially on HD channels, and the sound is very good. The DVD is easy to use; there is no tray, simply a slot behind the right-hand side. It is noisy when you first put the disc in, but much less so when playing it. You can set up favourite channels in a separate list, but you can't make this a default list: in other words if you press the CH+ button, it doesn't go to the next channel on your favourites list, but will just go from, say BBC1 to BBC2. My main criticism would be the handset. The buttons' sensitivity seems to be variable, so that if you press a button it sometimes registers twice or not at all. Also, some of the buttons are labelled differently from what the TV leads you to expect. For instance, if you are asked to press the Info button, you actually have to press one marked Display. My favourite button is the one which allows you to go back to the last channel that you were watching. Very pleased with this TV. The picture (full HD) and the sound are excellent. Good quality picture and great sound for this size TV - bought it because previous TVs had poor sound but makes all the difference with built in soundbar. Very pleased paid a little extra - worth it! The instruction book doesn't make it very plain when watching one programs and want to record another via the media USB stick. I spoke to a sales person at John Lewis, Solihull who didn't know the product but stated that he would telephone me back. The person did not contact me. Now that the price is even cheaper!!! Now then! who said that bedroom TV cant be fun. The boys have there Xbox connected plus the Bluetooth streaming sound from there ipads. amazing sound quality, too good for them really. A very happy household now. We replaced our old Sharp small TV with this Linsar model with built in soundbar and couldn’t be happier. The sound quality is incredible, in fact it’s better than our Panasonic 55” we have in the lounge. Our son showed us how to connect it to my iPad by Bluetooth to play music. The picture quality is also excellent and the TV plays DVDs as well. Very happy! John Lewis never let us down. Saw this advertised on the john lewis website. So glad it was a smaller screen as do not want 30"+. Visited store and purchased the last one the store had. Have set it up and delighted with quality of the picture and the inclusion of front facing speakers is excellent even though this was a display model we still received the 5 years guarantee also impressive as many others only had 2 years. Highly recommended. 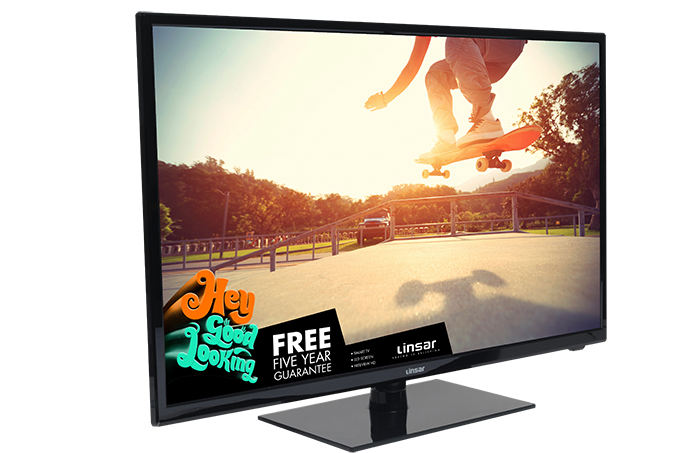 I was looking for a 24" digital TV but with reasonable quality sound, if possible. This model looked promising and its integrated DVD player seemed a bonus. I am now enjoying good sound, Freeview HD channels and an option to play CDs too. I am delighted with this versatile design - simple to set up too. It was delivered next day from John Lewis, complete with five-year guarantee. My husband and I are both really pleased with this TV. We found it hard finding one this size and John Lewis didn't let us down. The picture is amazing quality and the sound is great.you can bluetooth music from your device too. May buy another for our kitchen too! I read a review on this TV in Home Cinema choice and decided to buy it because of the built in soundbar. As JL give their TVs a 5 year guarantee it was the obvious place to buy it from. I have to say that the sound quality is something else, it sounds better than my 55" Panasonic and I can connect my iPad to it via Bluetooth to play music. The picture quality is also excellent. Very happy. Very pleased with my purchase. Initially I was sceptical as I've purchased Samsung televisions and was pleased with the quality. As a student this 24 inch Linsar is perfect for a small room. I'm yet to use the Roku stick and explore the full spectrum of services available. So far I'm pleased with the product and would recommend this brand. Excellent picture and really good sound. Nice sensible size. It is being used as a monitor as well as l now have Windows 10 on my PC. Good all round upgrade. 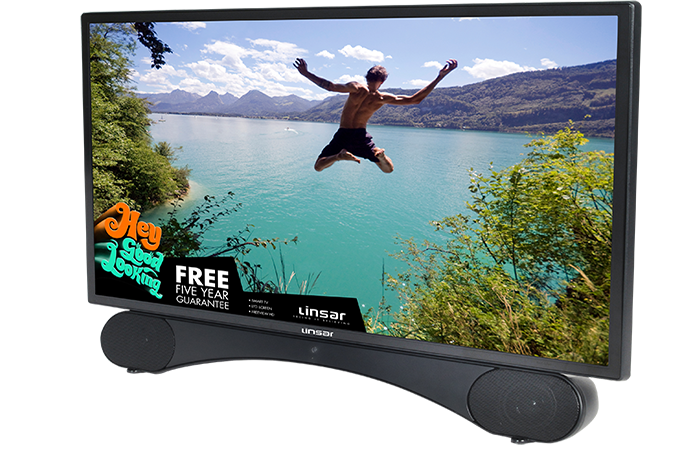 This TV was a little pricey for a 24" screen and I had not heard of Linsar so was a little doubtful but I had read several reviews recommending it so took a chance. Glad I did. Great sound, easy set up, DVD player easy and playing music or listening to radio is a dream. Still think a little pricey but was worth it. Excellent sound and picture. Would recommend highly. Was a bit reluctant about the product at first as not a brand I have heard about. Super sound system, easy to operate and work, would recommend. I am so pleased with my buy. The sound is amazing and it is a good size screen for me. It's made me very happy. So much better than my last TV! I have been really impressed by the quality of the sound and picture of this TV! So much better than my last TV which was a well known brand. 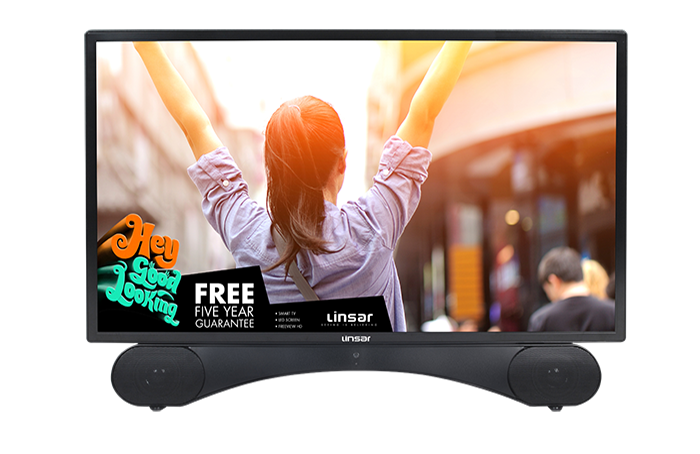 I had never heard of Linsar before going into the store but I will be recommending it to friends and family, especially because of the value for money for such a great TV. I can't wait to enjoy more programmes and entertainment once I receive the Roku stick. Perfect for the job. I'm not a BIG telly sort of person but 24 inches is really viewable. Great sound, as good as the old B+O it replaced. The DVD does stick sometimes...but not sure if this is the disc's fault.....quite possible but easy to rectify. Would recommend.